For well over a century, vacationers from all over the East Coast have been flocking to the town of Nags Head for a week or two of fun in the sun. These early visitors arrived to a landscape of a couple dozen 1 story cabin-style accommodations and a motel or two, spread out along the oceanfront beaches. 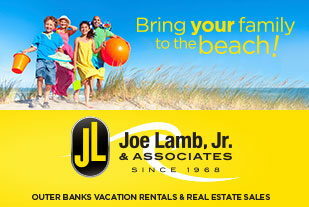 Today, however, Nags Head vacationers have their pick of vacation rentals of all sizes and locations, spanning the shoreline from the Albemarle and Roanoke Sounds, to the pristine soundside golf courses, to those popular oceanfront beaches that have never lost their allure over the years. It can easily be argued that not only is Nags Head one of the most popular destinations for Outer Banks vacationers, it's also one of the most varied, with accommodations ranging from 1 bedroom waterfront condos to 12 bedroom or more oceanfront palaces. As a result, visitors will find that in Nags Head they have one of the best and most versatile selections of rental homes on the coast, and plenty of amenities, attractions, and cool refreshing ocean waves within walking distance of their home or condo of choice. For the quintessential Outer Banks experience, or just to see what all the fuss is about from the past century, reserve a cottage, home, condo, or luxury estate in scenic Nags Head, and enjoy the local beach scene at its best. The "main" region of Nags Head spans from the soundfront to the oceanfront, and is cut through by two major roads that run the length of the town - the four lane US 158, better known to locals and frequent visitors as the "Beach Bypass," and the two lane Beach Road that borders the oceanfront. This section of town is home to all of Nags Head's major attractions and entertainment, including restaurants, stores, shopping centers, putt-putt courses, an 18-hole golf course, and a number of the Outer Banks' most popular local sites. Nags Head is home to the famous Jockey's Ridge State Park, which is unmistakable for its sky high sand dunes that border the Beach Bypass, and Jennette's Pier, the oldest pier on the Outer Banks, which has recently undergone a dramatic renovation transforming it into a fishing pier and educational center. As for a little retail therapy, visitors will find several shopping plazas including a nice-sized outlet center, and a number of galleries, specifically located along Nags Head's famed "Gallery Row." There are also plenty of sound beaches, ocean beaches, and watersports companies that are happy to provide rentals and / or tours for surfers, kiteboarders, kayakers, windsurfers, hang gliders, and virtually every kind of sports lover on the Outer Banks. At the southern end of Nags Head, where the Beach Bypass effectively ends as it intersects with US 64 towards Manteo and NC Highway towards Hatteras Island, the environment changes, and the town effectively becomes South Nags Head. This community stretches south from Whalebone Junction, (the US 64 / NC Highway 12 intersection,) to the heart of Bodie Island, with hundreds of vacation rental homes dotted along side streets adjacent to the oceanfront. This area is much different than its busy Nags Head neighbor, as South Nags Head is home to vacation rental homes, a fishing pier, and not much else. With the majority of communities here just a two minute stroll away from the beach, and few distractions except for the passing neighbor or fisherman heading to the pier, South Nags Head is a toned down, quieter version of Nags Head, that revolves around enjoying the gorgeous oceanfront shoreline. Both regions of the town, Nags Head and South Nags Head, are entertaining and inviting in their own way, and visitors are encouraged to explore all 12 miles of the town to determine their favorite for themselves. Nags Head also has an exceptional location that's close to the other major beach communities and attractions, including Roanoke Island, Kill Devil Hills, Hatteras Island and the northern Outer Banks, making it an easy launching point for day trips off the beach. As for the beach itself, Nags Head boasts miles of shoreline and 30 public ramps and / or parking areas, making it easy for anyone staying in this town to head over to the seashore. For a vacation that is centered around the beach, but offers enough off-the-sand entertainment to keep busy families occupied, Nags Head is one great Outer Banks destination. As stated, one of the biggest draws of Nags Head is the sheer variety of vacation rentals available, with multiple options in size, location and amenities, as well as age and style. In fact, the "Nags Head" style cottage has become a popular term among builders and developers, and refers to the basic architecture of the first beach homes that were built along the Nags Head oceanfront by wealthy vacationers. These homes had cedar shaked exteriors, colorful hurricane shutters, an almost Cape-Cod style and design, and wrap around porches that took advantage of those clear ocean views. Today, visitors can opt to stay in these original and renovated homes, located along the Beach Road on a stretch of shoreline called "Millionaire's Row," or can have their pick of modern replicas with ample room for large families, and those signature wraparound decks. Of course, regardless of style, visitors will find homes of all sizes available in all locations to suit their tastes, party size and budget. Nags Head has a number of 2-4 bedroom cottages, homes, and one-level beach boxes located throughout the ocean and soundside, in addition to larger 4-6 bedroom homes that feature private pools, game rooms, lofts and multiple living spaces, and other amenities to make a larger home feel more like a private retreat. On the high end of the spectrum, visitors can stay in impressive and elegant 7-12 bedroom homes that have all these features and more, including multiple master bedrooms, poolside Tiki or cabana bars, and theater rooms with stadium style seating and projection screen TVs. As for location, visitors can opt to stay by the soundfront for exceptional watersports access, or by the ocean along Nags Head's miles of beaches. 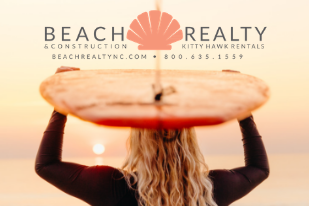 The homes along South Nags Head are especially popular with beach lovers, as all of these properties are at most a few lots away from the beach, ensuring an easy walk from any neighborhood. 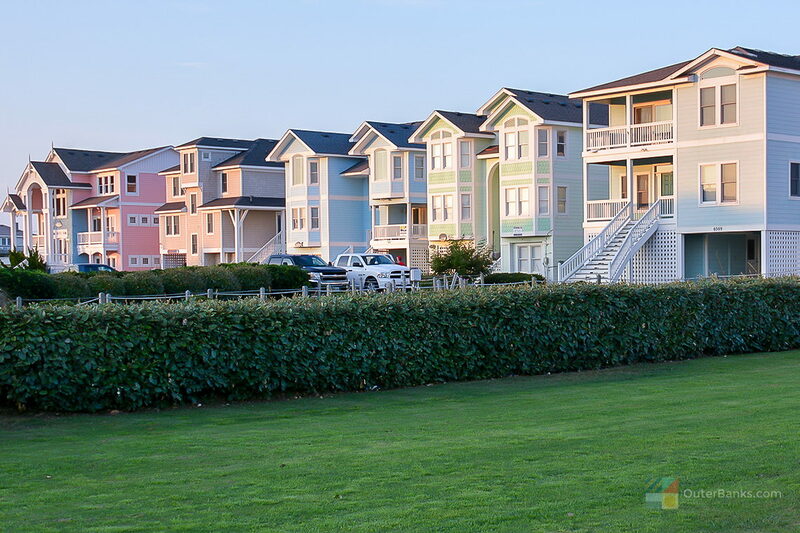 Nags Head also has a number of condos and townhouses as well, generally selectively located along the waterfront. Look for communities along the Roanoke Sound and Whalebone Junction for accommodations that have phenomenal sunset views over the water, seven nights a week. Clearly, regardless of where you stay, Nags Head has more than enough options to accommodate your party's taste in size, location, and extras. Spend some time reviewing the different areas and options available - with hundreds of rentals in all styles, choosing the perfect home can at times be a long, but completely rewarding process. One of the reasons why so many vacationers have been drawn to Nags Head over the decades is that it's essentially a beach town with plenty to do both on and off the sand. Nags Head has a little bit of everything the Outer Banks has to offer, from golf courses to fishing piers, shopping and galleries to state parks and watersports, so vacationers in Nags Head will find a sample of all the great aspects of the Outer Banks that have attracted generations of vacationers. 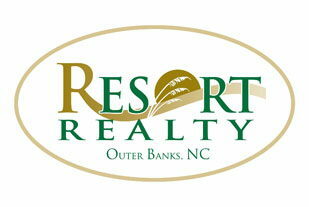 Another benefit of Nags Head vacation rentals is the landscape of the various neighborhoods themselves. The majority of rental homes in this town are laid out in distinct communities. They are located along residential side streets with walking trails, low traffic and congestion, feature pretty ocean or soundside scenery, and are essentially family-friendly environments that are inviting and peaceful. Folks staying in South Nags Head will enjoy little traffic and plenty of peace and quiet, while even vacationers in the busiest sections of Nags Head will find quiet streets and neighborhoods nearby to enjoy with an evening stroll. The beaches here, which are Nags Head's most obvious attraction, can be a little crowded in the summertime by Outer Banks standards, but there is still ample room to spread out a beach blanket, and plenty of clean stretches of shoreline to go around. With all this natural scenery and plenty of attractions, entertainment, restaurants, and shops to boot, Nags Head pretty much has it all for Outer Banks vacationing families. Folks who are staying in the soundside, or west of the bypass areas of Nags Head should note that they will have to cross the four-land beach bypass to get to the ocean by foot. While many vacationers don't mind the trek, or simply drive to a local public access or the more remote beaches along Bodie Island, this can be a deterrent for families who want an easy, two-minute walk to the shoreline. Keep in mind, however, the soundside properties have their own benefits for families, including fantastic homes, quiet neighborhoods, and soundside beaches, (ideal for young children), located just a quick stroll away. In addition, while Nags Head is ideal for families who like plenty of entertainment, dining, and shopping options off the sand, the main Nags Head area may seem a little too busy for folks who like their beach environment to be quiet and unpopulated. 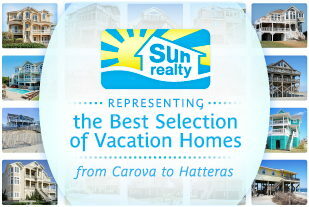 Visitors who are looking for more peaceful residential neighborhood can always explore the South Nags Head region, which is comprised mainly of vacation rental homes and no commercial development, or head south to Hatteras Island, a collection of seven quiet beach towns with miles of undeveloped shoreline in between. Despite these minor considerations, however, most visitors find that Nags Head is a good collection of all of the Outer Banks best attributes: attractions, entertainment, and of course, great beaches, and the area is a great first Outer Banks vacation destination for newcomers who want to get to know the OBX scene. Vacationers who love Nags Head but aren't fans of the summer crowds should head to the town during the shoulder and off seasons. A number of the restaurants and shops are open from March until November, and many, (including the outlet center and local shopping plazas), are open year-round. A Thanksgiving or late fall trip can also be the ideal time to get a jump start on your beach-themed holiday season, and the stores often have great end-of-season discounts and sales that cater to vacationers in need of a bit of retail therapy. Another great way to beat the crowds is to stay in the quietly scenic South Nags Head area. 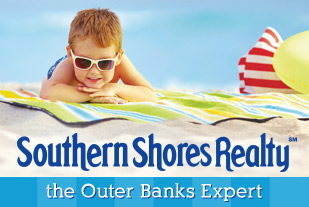 Located just a 2-10 minute drive from the larger central Outer Banks activities, but consisting of just residential neighborhoods that are close to the beach, South Nags Head is an ideal spot to book a quiet vacation rental that's close to the ocean, and still reasonably close to all the great off-the-beach things to do just a couple miles away. The soundside neighborhoods that border the Roanoke and Albemarle Sounds are one of Nags Head's unsung treasures. These communities have fantastic waterfront sunsets, exceptional access to local nature trails and soundside beaches and / or watersports launches, and scenic locales that are virtually hidden under tall live oaks and evergreen cedar or pine trees. Though a few minutes' walk away from the beach, these homes are picturesque, scenic retreats that are ideal for families who want to enjoy Nags Head's wild side. Keep your eye out on the local and regional event calendar. A number of the Outer Banks' best events happen in Nags Head, thanks in no small part to the newly created Windmill Point event grounds located adjacent to the sound on the southern end of the town, close to Whalebone Junction. This region is home to Nags Head's annual Seafood Festival, local fairs, and a number of other great upcoming events, which are announced throughout the season. Check with your property management company, or local news and information sites, to find out what great celebrations are happening during your stay. Romantics who love the idea of a classic Outer Banks experience should check out the renovated properties along "Millionaire's Row." Despite the name, many of these beachfront cottages are budget friendly accommodations with wide porches, hardwood floors and beamed ceilings, and all the features of a typical 1920s beach estate. Charming and historic, these homes also feature mile-wide views of the Atlantic, and are perfect respites for visitors who simply want to get away from it all, and take a little step back in time to boot. Nags Head is considered the Outer Banks' first beach destination, and it still maintains its popularity as one of the most beloved beach towns along the Eastern Seaboard. The reasons why are obvious to any vacationer - gorgeous beaches, plenty of local sites and attractions, and ample accommodations to suit any taste, budget or style. For a vacation that encompasses all the charm and entertainment of the Outer Banks, visitors should head first to Nags Head. The community where OBX tourism began is still one of the most desirable and visited locales along the Outer Banks, and from the busy neighborhoods bordering the beach bypass to the quiet oceanfront communities of South Nags Head, this vacationer devotion shows no signs of slowing. Enjoy a full week of sun, sand, and plenty of off-the-beach fun, and discover the beach town that put Outer Banks vacations on the map. When it comes to gorgeous beaches and laid-back charm, Ocracoke Island is often considered the gem of the Outer Banks. Accessible only by boat, this small island has been separated from the rest of the world for centuries, and as a result, has one of the most unique beach atmospheres found anywhere along the coastline. Gray’s Outer Banks Lifestyle Clothing Company offers quality fashions and accessories for the whole family by all your favorite designers including Tommy Bahama, Brighton, Sperry, Vera Bradley, Fresh Produce, Tribal, Spartina, Billabong and much more. Whether you’re shopping for apparel, headwear, tumblers and glassware, gifts, toys or OBX souvenirs and apparel, Gray’s offers the best brands and quality for a beach lifestyle.